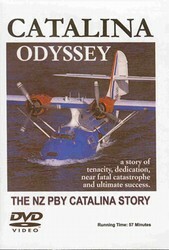 Catalina Odyssey is a story about one man's dream of procuring a WWII Catalina PBY flying boat and a dedicated group's support of that man and his dream. In the early 1990's, Dr. Ross Ewing, aviation medical practitioner, historian, writer, and ex-A-4K Skyhawk jock in New Zealand proposed a daring project to like-minded aviation fans. Search the world for a WWII-era Catalina PBY seaplane, purchase it and ferry the aircraft back to New Zealand. Therefore, this is the story of that entire effort: "No one ever said that the task would be easy. No one ever suspected the task would be so difficult. And no one dreamed of early disaster which would ensue." The triumphant result was a flyable Catalina PBY amphibious seaplane in New Zealand. The DVD covers the procurement process for the PBYs, the near disaster in the early 1994 during a cross-ocean ferry flight and the resulting triumph late in that same year which brought a Catalina PBY to New Zealand. This aircraft is the only flyable PBY in New Zealand. It is carefully operated and maintained by the Catalina Club of New Zealand, being flown to countless airshows. Club members can qualify to fill the various crew slots for the aircraft such as pilot, first officer, etc. There are some beautiful shots of the Catalina PBY, taking off, landing (from both land and water) and, of course, flying. In additional, many of the flying shots are backdropped by spectacular New Zealand scenery. This DVD is a must-have for the collection of every Catalina PBY fan - a flying Catalina in living color! In NTSC DVD format and color - region-free with a runtime of about 57 minutes.